LaunchKC achieved orbit around the tech world on Friday afternoon, when its first 10 grant recipients were introduced before a full house at Techweek Kansas City. The 10 winners, which include six Kansas City area businessess and one international company, are walking away with a $500,000 in grants from LaunchKC. Earlier in the way, 20 tech startups spent the day pitching their business plans at Union Station to judges who selected nine winners. 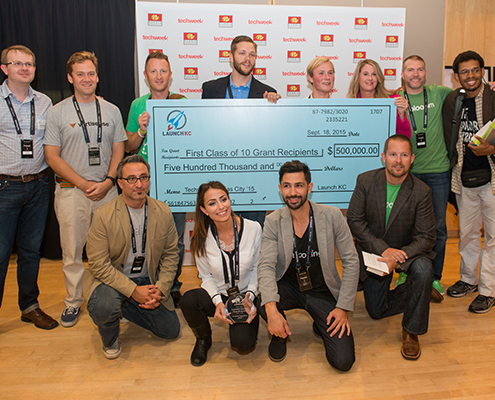 One additional winner was selected as the People’s Choice Award grant recipient by Techweek KC attendees. In total, almost 500 entrepreneurs from 17 states and eight countries applied for the new global grants program run by the Downtown Council of Kansas City, which is leading the effort in collaboration with the Economic Development Corp. of Kansas City. HealthID: Angelo Pitassi Jr., Cranston, R.I.
SquareOffs: Jeffrey Rohr, Kansas City, Kan.
Vertisense: Christopher Ayala, New York, N.Y. In addition to $50,000 grants, the 10 selected startups will receive a network of support, including 12 months of free office space in Downtown KC; industry-specific mentor teams for each grant recipient; and opportunities to meet and learn from industry and entrepreneurial leaders in and around Kansas City – all designed to elevate their efforts to build high-growth, tech sector businesses and jobs in Downtown KCMO. To receive the grant, startups must agree to relocate to Kansas City for a minimum of two years. The grant also includes one year of free office space in downtown Kansas City, a Sprint Galaxy phone with one year of free service, industry-specific mentors and other support services. LaunchKC also will help the startups identify follow-on capital and angel investments. LaunchKC is powered by visionary investments and commitments by the Missouri Technology Corporation, the City of Kansas City, Missouri, the William T. Kemper Foundation and UMB Bank, along with more than 20 civic, corporate and philanthropic sponsors of the first-year initiative, including Burns & McDonnell, The Cordish Companies, DSI, Lead Bank, State of Missouri – Department of Economic Development, J.E. Dunn Construction, DST Systems, Husch Blackwell, Kansas City Power & Light Company, Lathrop & Gage, Polsinelli, LLC and other partners.